Link typed text to a specific time of a QuickTime movie. Is there a better alternative to Lucas_Dambergs? Is Lucas_Dambergs really the best app in Video category? Will Lucas_Dambergs work good on macOS 10.13.4? 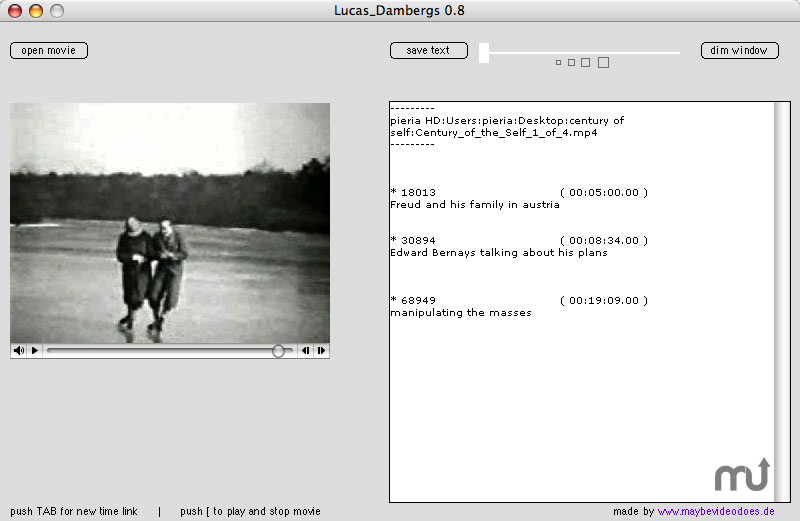 Lucas_Dambergs enables you to link typed text to a specific time of a QuickTime movie, DVD or Video_TS folder. Once a time index is linked to a set of notes, you can jump back to the selected scene and add notes by clicking the index link. Save file and re-edit is enabled. Version 0.9.3.4: Release notes were unavailable when this listing was updated. Mac OS X 10.2 or later No DVD support for Intel Macs. Lucas_Dambergs needs a rating. Be the first to rate this app and get the discussion started!